Last year there were soft growls across the Twin Cities theatre scene. The rumors and whispering of a phenomenal show that had just opened at the Jungle Theater were sweeping across social media and various critics sites. The show dealt with gender roles, breaking the norm and also standing out in a crowd. It was led by nine incredible young women and was critically acclaimed. It was announced last year that this show would have a remount with the same cast and team and that show is The Wolves by Sarah DeLappe and produced by the Jungle Theater. Set inside an indoor soccer facility, nine teenage girls stretch themselves out before a soccer game. The show is stylized in various scenes that are similar in a physical sense in which they all share their own personal struggles, gossip about other teammates and the impending fear of not being offered scholarships to colleges. I wasn’t able to see the show during its initial run at the Jungle - where as this show is remounted to fit the quaint stage at The Southern Theater - but I’m so thrilled I was able to see it now. I get it. At first I didn’t know what to expect because it didn’t seem like something I’d be open to seeing. It is authentic and real. The overlapping dialogue may seem chaotic at first however it’s so genuine that you quickly fall to love it. Delappe is strategic in her writing as well due to the fact that we only see them on the field. We never see these young women in their own lives outside of a pair of shin pads and cleats so at times we are almost left in the dark on what they are talking about however we are quickly brought back in with the girls fast paced dialogue. Through Delappe’s brilliant and realistic writing, along with Sarah Rusmussen’s incredible direction, these nine women create truly a beyond remarkable ensemble. They truly are an ensemble in every sense of the word. They all score in their individual ways both big and small and step back when it is not their time to be in the spotlight. 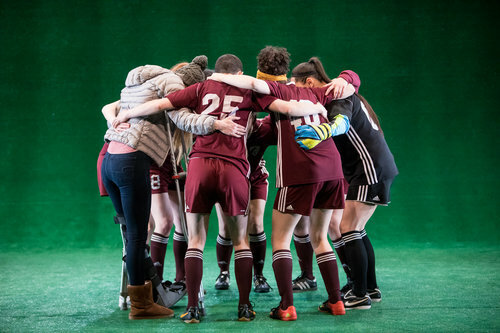 The irony of this play is that each and every actress allows their cast mates - or teammates - to shine similar to what a real soccer team should be like. I especially loved this stage and space for this show because at times it really did feel like an indoor soccer facility with the concrete and dramatic uprising of the seats. It really gives it the vibe of being in risers at a stadium. The set is simple but effective, designed by Sarah Bahr, with lighting by Karin Olsen. I will also note that this is the first time I’ve been to a show in which the program included a “Soccer Consultant” which was pretty impressive because the cast really did look like a soccer team during some of their warm ups. I was slightly entranced by a warm up, dubbed “The Spider web”, watching them all pass to each other while also delivering their lines. While the script does dive into some gossipy teen drama there are some really darker and deeper themes that I think the cast handles very well in creating their characters. The story line that threads I think a big piece of the show together is #7, played by Becca Hart, is rumored to either have had an abortion or taken Plan B after a potential pregnancy scare. This character is also the most aggressive with her language that makes it feel even more real when teenagers learn to swear and try to incorporate it in every single sentence and Hart plays it wonderfully. The rest of the cast includes Chloe Armao, Megan Burns, Meredith Casey, Michelle De Joya, McKenna Kelly-Eiding, Isabella Star Lablanc, Rosey Lowe, and Shelby Rose Richardson. Each actress delivers incredible performances that I can’t even begin to single each and every one f them out. The Wolves is a timely piece about grit and the power of young women. It’s a quick 90 minute play with a lot of great themes that I find extremely important for everyone to see in this day and age.